That was unexpected really. We were all waiting to see the price of the GTX780 to drop to $550-ish, then the price of the Titan to $799 and finally add a new card to the end of the spectrum at the magic $999. No, that's not what is going to happen - at least immediately. It's going to be GTX780 Ti. Well, the Titan Ultra or whatever will inevitably come out because that is not something NVidia has to design from the scratch. It is already designed. That's the full blown GK110 chip - the big Kepler. However, that silicon is not yet being used even in their workstation graphics cards. The K20x, which is the fastest Tesla card only supports 2688 shaders. That's the same count as found in the Titan. This is the first time NVidia has used the Ti moniker in their flagship card. (Titan is of course the flashship card, but that is more of a dream chip) The GTX *80 is usually the flagship card of the generation. The Ti moniker is reserved for mid-range/mainstream graphics cards like the GTX *50 or GTX *60. The thing is, just like we have no clue what the R9-290X's specs or pricing will be, it's the same story with the GTX780 Ti. But there were a few of official results the reviewers were allowed to post, and according to them, the 290X could easily own a GTX780. But we only have the performance figures for 4K gaming. It could be because AMD cards seem to incur a less of a performance hit that NVidia as the resolution goes up. The 1080p results might be almost same. In my opinion, the GTX 780 should still come down in price. Heck, there is no reason for it to be $250 more expensive than the GTX 770. NVidia should drop the price of the GTX780 to $550 and perhaps introduce the GTX780 Ti at the $650 price point. 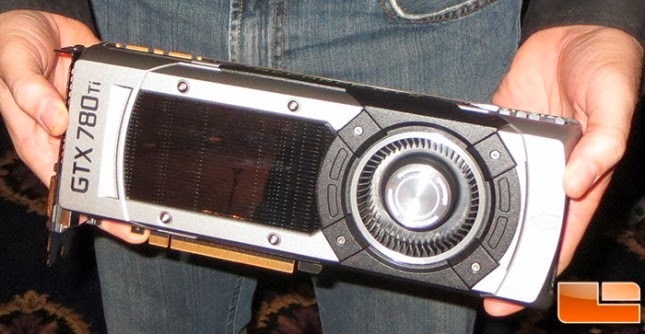 But the issue is, GTX780 is so close to the performance of the Titan. The only differentiating point is the amount of RAM present. Yes, it has better compute performance compared to the GK104, but that is not much of a concern for the gamer. GTX780 Ti will obviously be faster than the GTX780, but how much? That would be faster than the Titan in gaming benchmarks, except in 4K game-play perhaps. That's a really niche market. It's actually a niche in a niche market. Remember, the only 4K monitor that is currently available is the Asus 32" monitor which costs $3000+. So, the GTX780 Ti would cripple the position of the Titan in the line up. NVidia won't be able to charge $999 for a card that performs slower in most scenarios (or for most people, in all scenarios.) It would be very interesting to see what NVidia would price them at. On another note, AMD has actually delayed the launch of the R9 290X. I believe this is to see what NVidia was up to. It's time for PRICE WARS! OH YEAH! Good times for the consumer. [Rant] NVidia Shadow Play, here I come! [Rant] Why upgrade your phone every two years? [Rant] Do I really need a headset?